The mosquito population is expected to boom in the next week or two, according to Susan Paskewitz, professor of entomology at UW-Madison. Recent rain is a factor and mosquito trapping is an indicator. Mosquitoes can transfer the West Nile Virus, though Paskewitz said Wisconsinites have a “remote risk” of being infected. AUDIO: (:58) Paskewitz suggests you eliminate or reduce the amount of standing water around your property to keep mosquitoes at bay. Those blood-sucking insects can be annoying — and gross. It’s true, Paskewitz said, some people are more attractive to mosquitoes than others. It could be related to one’s diet, skin bacteria, perspiration, body temperature, or color of clothing. Help keep mosquitoes out of the area by eliminating or reducing standing water on your property, including from clogged rain gutters, bird baths, and spent tires. 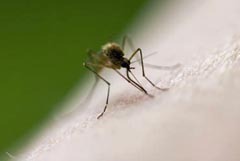 Avoid bites by wearing long sleeves and pants and using a mosquito repellent. There are about 55 types of mosquitoes in Wisconsin, Paskewitz said.